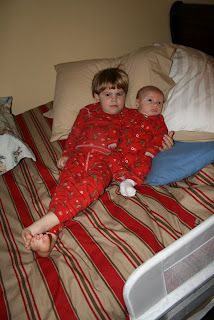 I've waited all my life to dress my kids in matching Pajamas. Don't ask me why. Look at the way Miller and Davis have their feet crossed in the exact same way. This is Miller's mean face. 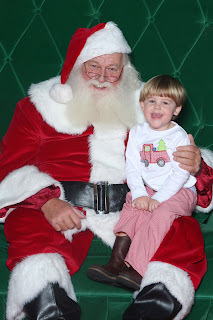 Miller was sooo excited to visit Santa! 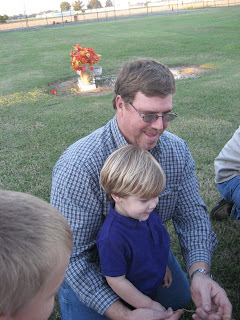 A big change from last year when he was scared to death of him. He told him he wanted a baseball jersey, baseball hat and baseball. I hope he gets it! Just a little update on Davis. I took him for his 3 week checkup this week and he weighed 8 lbs 2 oz. He grew a whole pound and an ounce in 2 weeks. He is sleeping good at night. I am only getting up twice to feed him and then he goes right back to sleep. Everyone keeps asking how Miller man is adjusting. 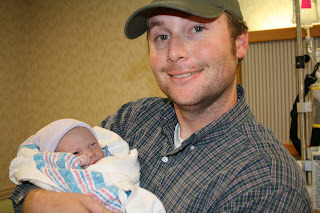 To be honest, Tim and I were worried about how he would handle the new baby. But, he loves Davis. He wants to kiss him and "pet" his head. 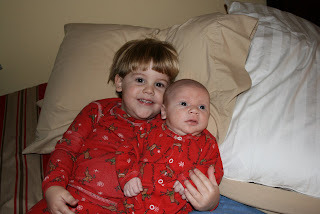 He always wants to hold him, and he will insist that "my hands ARE clean". He doesn't understand germs just yet. 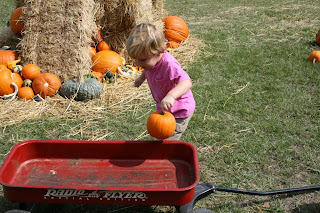 Miller told me yesterday that when Davis "growed" up he was gonna teach him how to jump. What a great big brother. Tim and I took Miller to the Curry Christmas Tree Farm in Start to pick out a tree! He is just over 3 feet tall, as you can see, as measured by the giant candy cane. 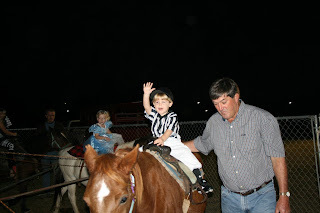 He liked riding the "horse" much better than he has ever liked riding real horses or pony's(he's afraid of the real ones, and I don't blame him). He helped us pick the perfect tree! Davis didn't get to make the trip. It was too cold and almost rainy for a 16 day old. I included some pictures of him though just so he wouldn't feel left out. Davis doesn't like the flash. He kept scrunching his face all up. Ready to go out and about! 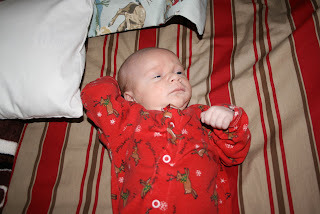 Davis was born November 12th at 5:43 pm. He weighed 7 pounds even and was 20 inches long. He is just beautiful and such a good baby. 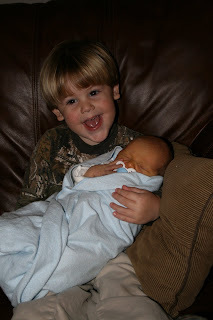 Miller loves him and being the "big bro". We are all at home now and doing great! Just an update for baby #2. 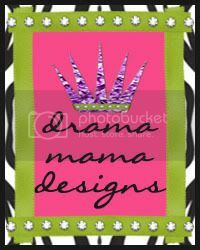 I will be induced on Wednesday, Nov. 12th, unless the baby decides to come before then. I'll keep you all posted! 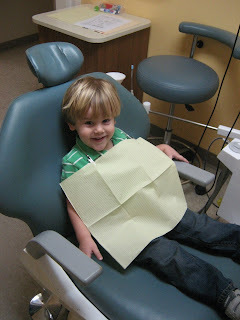 Miller made his 1st trip to the Dentist a few weeks ago. 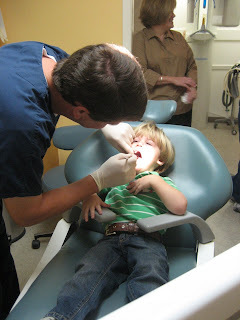 He was really great and loved Dr. Chad! He thought his new Elmo toothbrush and blue toothpaste were awesome, but I think he liked the bouncy ball he got the best. 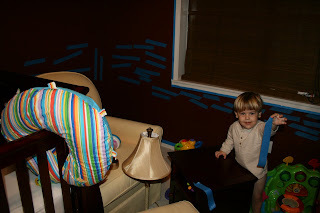 Miller was "helping" me tape the baby's room so we could paint it. Notice what a great job he did! 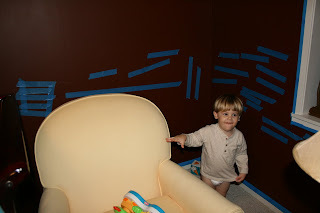 He was very proud of his work. 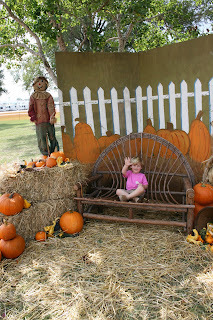 Happy Halloween to everyone! 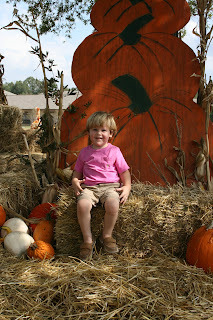 Mama, Daddy and I took Miller to the Tallulah Academy Halloween Carnival last Wednesday. 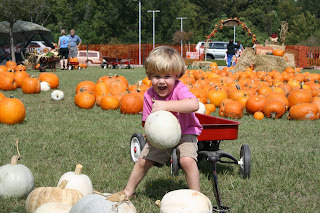 He had so much fun. 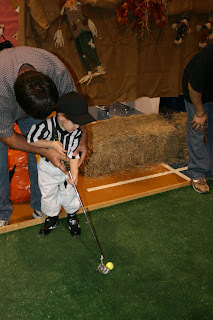 He got to ride the ponies, play putt putt, pick up ducks and walk in the Toy Walk. 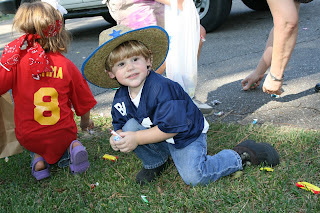 He ate a lot of candy - which I'm pretty sure was his favorite part. 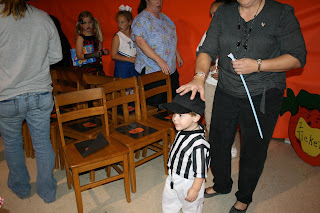 He loved wearing his Referdee (as he says) costume. 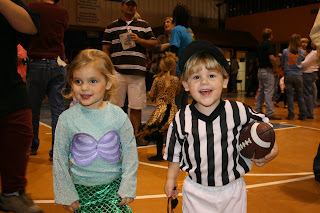 I'll post more Halloween pics and try to get a video up later. 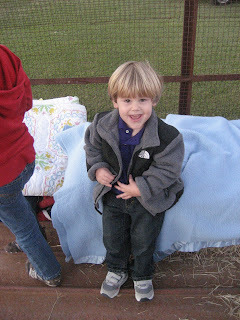 Miller's Nonna and Uncle Billy Bob (My Aunt Laura and husband Billy Sevier)took him to the Transylvania Baptist Church's Hayride. 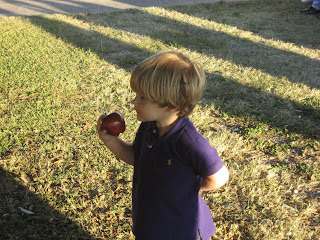 First, there was waterless bobbing for apples in which they hung apples from the trees and the kids ate them off. Miller, I'm told, just tore his off the tree. Then they roasted weenies for hot dogs. 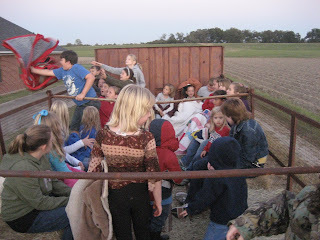 Lastly, they went on the hayride. They rode to the levee by the Mississippi river and then came back. 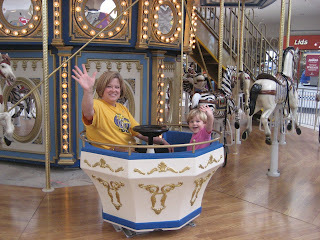 The ride was Miller's favorite part because he said they saw some deer and a cow. 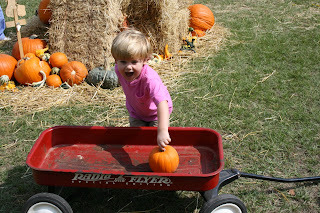 Heading off on the hayride. 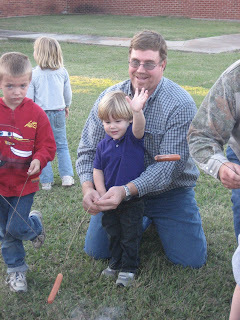 Miller and Uncle Billy Bob roasting weenies. He's too busy to look up so he just gave a wave. 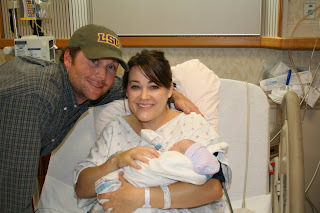 Notice the LSU purple shirt. It was the night of the South Carolina game. Miller always knows that Saturday's are game days and that means he wants to wear his purple and gold! I just had to post this. 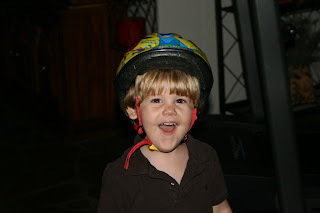 Miller is the only child I know cautious enough to WANT to wear his Elmo helmet to ride his tricycle. He insists on it. Most of the time I'll say, " oh you'll be fine just ride". 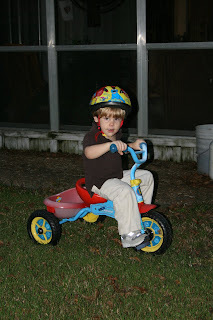 I think that's great and all that he wants to wear it - the funny part is, he can't peddle yet. He just sits on it. That's why there is no pushing on my part for a helmet. I know he's not going anywhere. Elmo wears his helmet while riding so Miller wears his. Who says kids don't learn anything from TV? 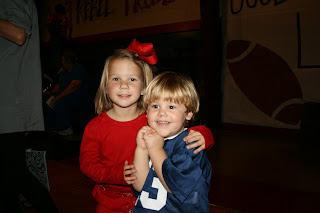 My cousin Mary Beth made the Homecoming court at Briarfield Academy. 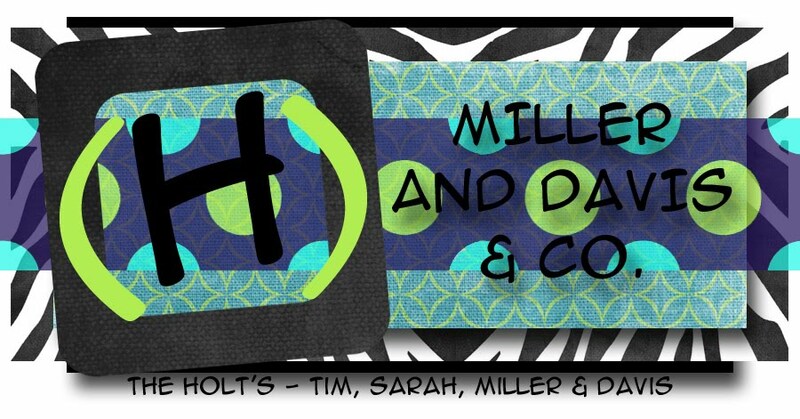 Miller had a busy time attending all the day's festivities! 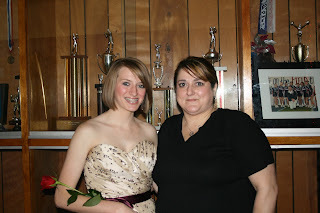 Mary Beth and her mom, my Aunt Liz. 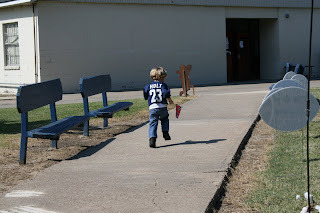 Miller got a little restless during the ceremony, so we took a little break to run outside. 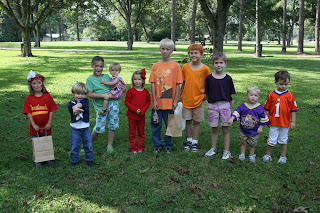 All the kids at the parade, Emma Brown, Miller, Lily Kate Thornton, Jack Martin, Caroline Martin, Holt Martin, two neighborhood kids and Bruin and Wyles Gilfoil. 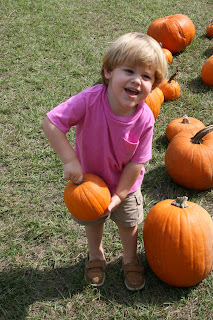 First we picked pumpkins at the First United Methodist Church in West Monroe. This little one looks just right for Miller. 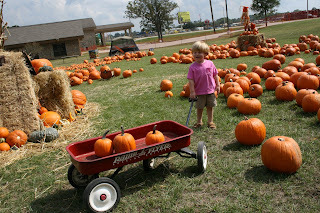 Miller liked the little ones - the ones he could pick up and put in the wagon! He found a white one! 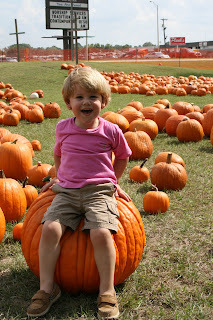 The biggest pumpkin he ever saw!!! 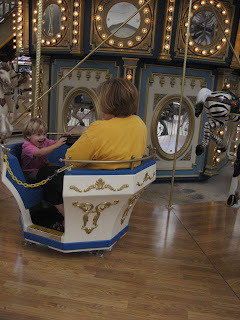 Next was riding the spinning thing on the carousel at the Mall. 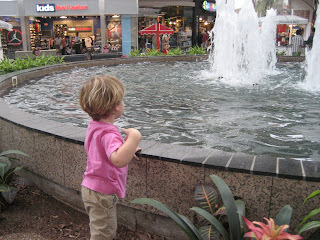 Last was throwing pennies into the fountain. He threw 15. Not sure if that makes for 15 wishes or 1 wish multiplied by 15? Tim and I went to Baton Rouge last weekend for a wedding and then the Mississippi State game. Miller stayed with his BB and Papa. (My mama and daddy.) When we got back home Sunday afternoon Miller had a brand new puppy. Apparently, they were just giving them away at Wal-Mart and Miller wanted one, and that was all it took. Miller's Papa said he could have a puppy. Papa better be glad it lives down at his farm. 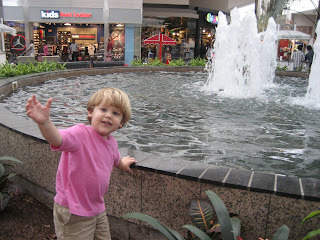 We go visit as often as possible. Miller named the puppy Marty (after Wal-Mart). Marty is half blue heeler half cur dog. 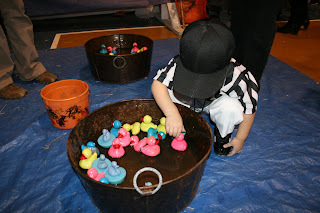 Here are some pics of our most recent visit. The brown puppy (that's Buddy) is another stray Papa picked up to keep Marty company. Papa helping Miller hold Marty. Miller's best buddy besides his Daddy. 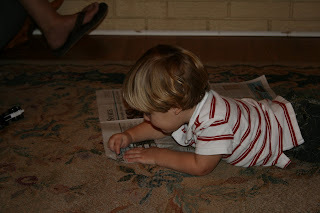 I was trying to read the paper when Miller said he wanted to read the Sports section of the newspaper to me. 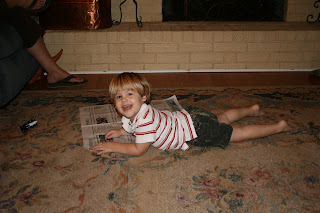 His story went like this, "LSU tiger stadium, run!" I asked, "is that it?" "Yep", he replied. I guess if that was a good enough story for him, it was good enough for me.